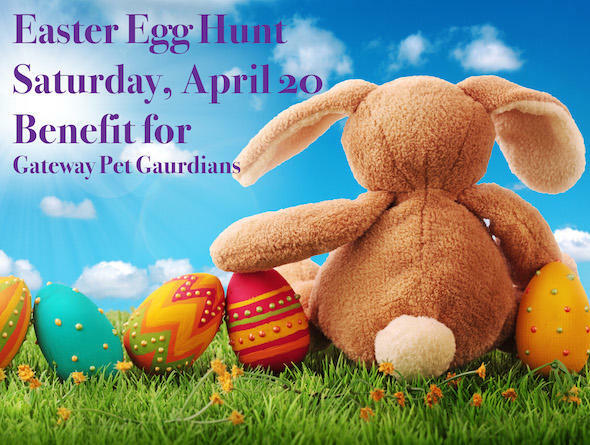 The 2019 Easter Egg Hunt for Dogs is on Saturday, April 20 our annual Easter fundraiser for Gateway Pet Guardians and Metro East Humane Society. A donation of $5.00 will allow you and your dog to find five eggs hidden INSIDE our shop. 100% of the proceeds benefit the work of partner charities! There are prizes inside each of the eggs including coupons for a free Easter Toy, Decorated Treat, Jumbo Easter Egg Treats, $5 and $10 coupons and more!. It’s happening from 10 AM – 3 PM at both our Lafayette Square and Edwardsville shops. The Easter Bunny will be making a special appearance at our Edwardsville shop from 11 am - 1 pm. For an additional $10 donation, your dog can have her photo taken with the elusive Easter Bunny.